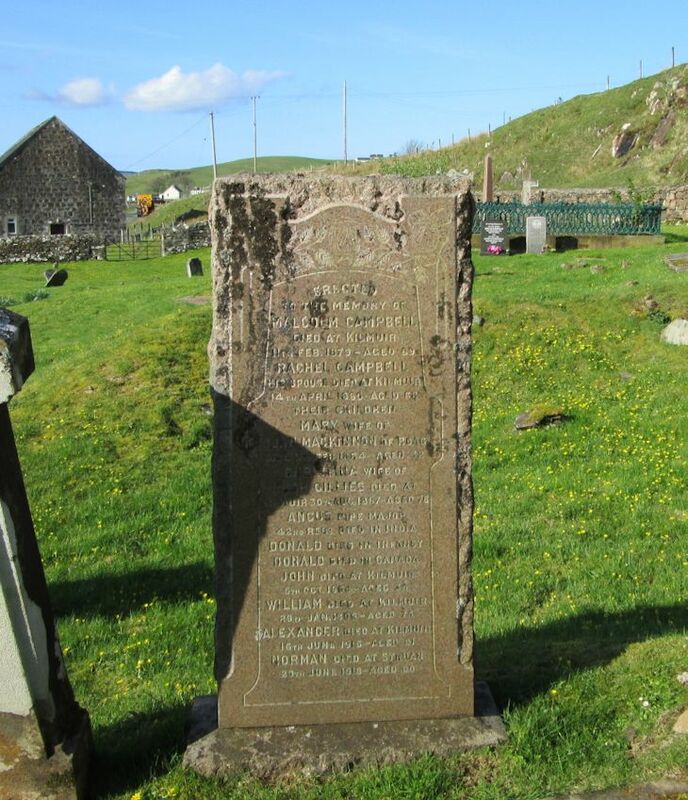 Erected/to the memory of/MALCOLM CAMPBELL/died at Kilmuir/11th Feb. 1879 - aged 89/RACHEL CAMPBELL/his spouse died at Kilmuir/14th April 1865 - aged 68/thrir children/MARY, wife of/JOHN MACKINNON of Roag/died 9th Feb. 1864 - aged 32/CHRISTINA, wife of/HUGH GILLIES died at/Kilmuir 30th Aug. 1897 - aged 78/ANGUS Pipe Major/42nd Regt. died in Inda/DONALD died in infancy/DONALD died in Canada/JOHN died at Kilmuir/5th Oct. 1864 - aged 35/WILLIAM died at Kilmuir/29th Jan. 1906 - aged 75/ALEXANDER died at Kilmuir/16th June 1915 - aged 81/NORMAN died at Struan/20th June 1918 - aged 80. My comment is not related to the picture, but to the transcription of the gravestone information. I believe that the date given for the death of Malcolm Campbell (1979) is incorrect. From the rest of the information provided, I believe it is clear the the year should be 1879. Added by John Lee MacLeod on 09 May 2017. You're right, John. Thanks for that. Added by Roddie49@john-lewis.com on 09 May 2017.